When I was on the AIGA Los Angeles board, our meetings were always held at the offices of Sussman/Prejza, the design firm which I idolized due to their work on the 1984 Summer Olympics held in LA. I’d always hang back after our meetings were over, snooping around to look at the current work that was on the walls, and hoping to catch Deborah as she left for the night, if only to see what dazzling patterns she had managed to coordinate in her legendary outfits (she was my hero in more ways than one). After one meeting, I noticed the parking lot was filled with signage of some sort. I employed my usual nosy line of questioning and Deborah revealed that they were signs from the Olympics, being moved from one storage space to another. I nearly fainted. 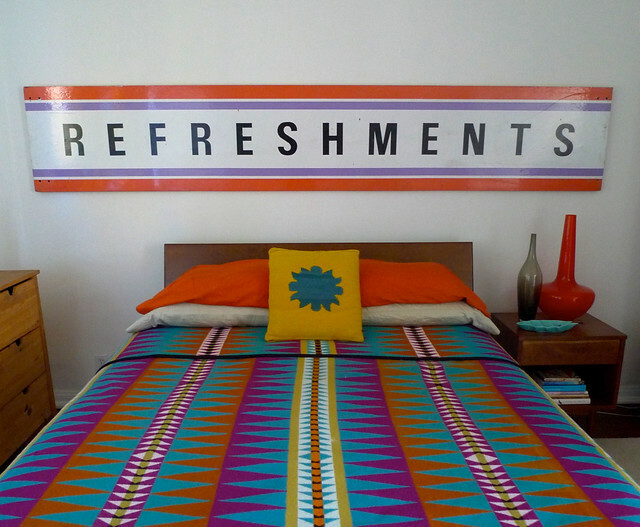 And that’s how we came to have one of the original “Refreshments” signs from the 1984 Olympics hanging over our bed. (Don’t worry, it’s very secure and not going to fall on our heads in the night). Sussman/Prejza along with the Jerde Partnership designed one of the most important things to ever happen to Los Angeles. Olympic games are legendary for going over budget and out of control, sometimes leaving cities in worse economic and infrastructural shape than they were before. The brilliance of the 1984 Olympics was that organizers vowed to stay fiscally responsible, electing not to build monumental new stadiums, for example, and use almost all existing structures as venues. The branding elements were made from inexpensive materials—inflatables, scaffolding, cardboard—which carried a huge visual impact with a light touch. A foundation was established with the profits that continues to support local athletic programs. It remains the only financially successful Olympics in history. The Olympics are of course not the only project that Deborah and her team worked on—she started her career working under Charles and Ray Eames and has completed projects all over the world—but her legacy is best seen through the work she did right here in LA, in the shops, parks, museums, and many public spaces that built this colorful, contemporary city. And that’s why I’m so excited that Woodbury University is mounting an exhibition to bring Deborah’s work to life for the next generation of Angelenos. The organizers are currently running a Kickstarter to finance this worthy exhibition, and they’re about halfway to their goal with 15 days left. This exhibition is a must for design nerds. Or Olympic nerds. Or LA nerds. Whatever kind of nerd you are. It’s not often that you can trace the visual impact of one person who made a city more beautiful. 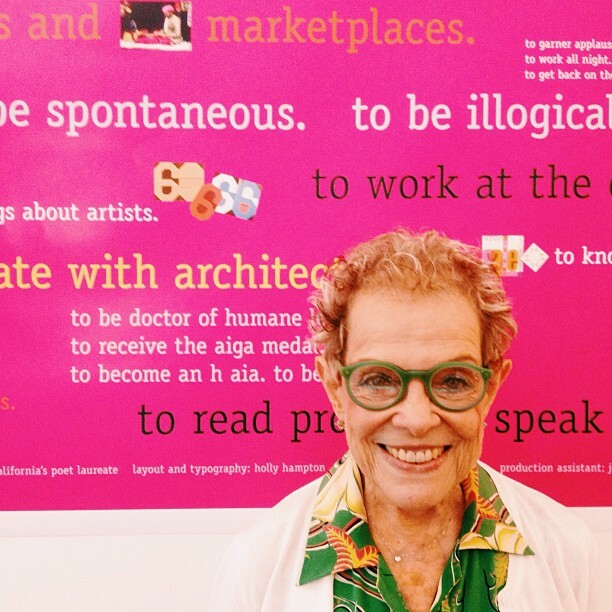 Los Angeles is a better place because of Deborah Sussman—and we’re so lucky to have her stories and her work in one place to celebrate her awesomeness. And of course I’m really excited to see what gorgeous getup she wears to the opening. Learn more about the exhibition and how you can support it here. And read more about Deborah in my story in the New York Times and check out my interview with her for Los Angeles Magazine! Editor’s Note: This story was written in 2013. Deborah sadly passed away on August 20, 2014. I’ve posted the full transcript of my interview with her for Los Angeles Magazine, plus some more thoughts, here. She will be deeply missed. This entry was posted in building, creating, designing. Bookmark the permalink.